Aside from Cioppino, I’m not crazy about fish for dinner. Most people who don’t love fish just leave it at that. They’ve accepted it. I wish I were more like them. Instead, I find myself obsessing over finding seafood dishes that I can actually get excited about. I’m always looking for “the one that didn’t get away” in the recipe department. I’ve finally found my catch of the day thanks to celebrity chef and cookbook author Ina Garten, my favorite Barefoot Contessa. This simple skillet dish is called Sole Meunière (pronounced “mah-nyear”). But don’t let the name scare you. Meunière is really a fancy word for fish Sautéed in butter and sprinkled with lemon juice and chopped parsley. That’s pretty much it! Once you grate and squeeze the lemons, the entire process only takes about five minutes, and it goes right from the skillet to the table. Not only have I never “Meunière” something but I’ve never had Dover Sole, so this week I experiences two “firsts” in the kitchen. Is Sole Meunière destined to be one of my go-to dishes? I can answer that by telling you how many times I’ve made it since discovering it. Let’s just say a lot. 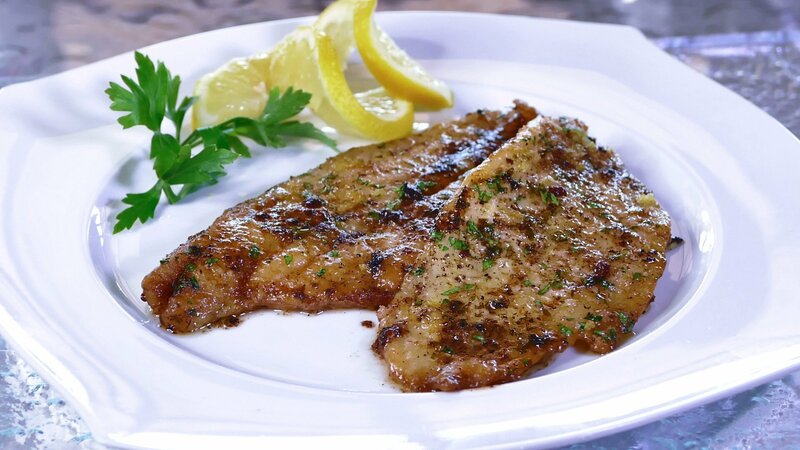 Sole Meunière is the perfect catch for dinner any night of the week. Watch my How to Video for Sole Meunière here! Combine the flour, 2 teaspoons salt, and 1 teaspoon pepper in a large shallow plate. Pat the fish fillets dry with paper towels and sprinkle one side with salt. Heat 3 tablespoons of butter in a large sauté pan (10-12 inch pan) over medium heat until butter just begins to brown. Dredge 2 fillets in the seasoned flour on both sides and place them in the hot butter. Lower the heat to medium-low and cook for 2 minutes. Turn carefully with a spatula and cook for 2 minutes on the other side. While the second side cooks, add 1/2 teaspoon of lemon zest and 3 tablespoons of lemon juice to the pan. Sprinkle with the parsley, salt, and pepper. Keep fillets warm in a 200 degree oven and make the second batch using the remainder of the sole, butter, lemon, parsley salt and pepper. When all fillets are cooked, serve immediately. Can you guess the most popular seafood products in the US? Shrimp, Salmon, Tuna, Tilapia and Alaska Pollock.